A purpose helps us define ourselves. What we believe in, what we fight for, why we do the things we do. A purpose can be anything that explains to us, the why of our life. Some of us seem to be born knowing exactly what our purpose is and how to go about living it. Though for many of us, we stumble around in the dark for quite awhile before we begin to figure it out. And often, our purpose doesn’t reveal itself with instructions and a detailed job description. Instead, we can spend years fumbling around in the twilight looking for clues, taking a parallel path, or even completely missing opportunity after opportunity to claim our path. 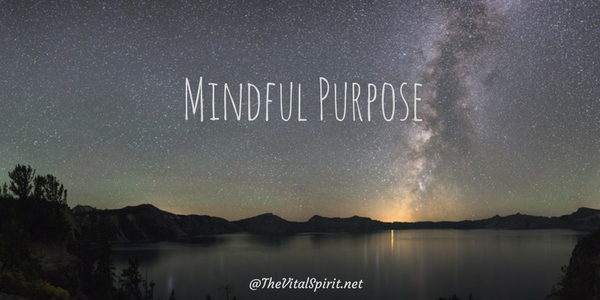 Mindful purpose means staying curious about what lights us up. We need to follow the different clues and signs until we find clarity, and most importantly learn to let go of what others think about us and our passion. Take classes, find people with the shared interest, and be open to change in your life, sometimes dramatic change. An important part of living our purpose is finding support during our journey. People who can cheer us on when we are frustrated, people who can help us sort out our fears, and people who can guide us through the tricky parts. And while no two journeys are the same, each journey has certain mileposts in common and having a support system of fellow travelers can make all the difference.